Robert Hughes’s latest tome, Rome: A Cultural, Visual, and Personal History, proves once again that this erudite man can take on a mammoth task such as chronicling the entire history of Rome, the city, and the Empire, from its foundation to the present day. Indeed, he not only succeeds at this mind-blowingly ambitious undertaking, in Rome, Robert Hughes renders Rome’s rich history, fascinating, accessible, and compelling. 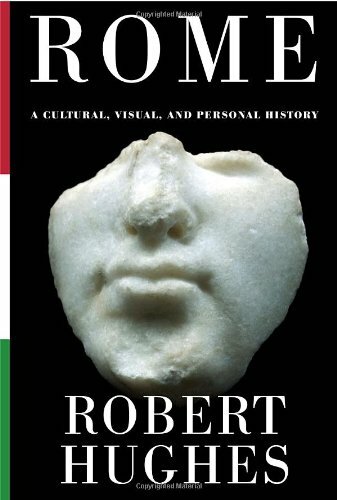 Rome: A Cultural, Visual, and Personal History is a nonstop read, sweepingly ambitious and fascinating, even in those moments, especially in the early chapters where clumsy sentences leave the reader feeling like the first on the scene at a terrible accident. Mr. Hughes plows on, however, and his beguiling prose and anecdotes keep the reader tethered to his narrative. Of course, readers expect nothing less from the author of such seminal texts as The Shock of the New (1980), and The Fatal Shore (1987), as well as several other fascinating, though less well-known books such as Culture of Complaint (1993), A Jerk on One End: Reflections of a Mediocre Fisherman (1999) and, Things I Didn’t Know (2006). Bookended by two essays, one a charming personal account, the other a bitter tirade on Rome’s current cultural malaise, this book takes the reader on a journey as sweeping and all-encompassing as Mr. Hughes’s writing career. The prologue, intimately chronicles Mr. Hughes’s person relationship with this city, and is wonderful, leaving the reader with the same sense of awe Mr. Hughes felt as the young naive Aussie on his first trip abroad. Robert Hughes, an art critic and historian, renders Rome a creation of artists, not of soldiers Emperors or businessmen, although in fairness, he does acknowledge the latter’s role in hiring the artists. But the book is not without its rocky moments. The lack of editing in today’s publishing industry is a pervasive cliché, but by not providing Robert Hughes with a sufficiently talented and time rich editor, Knopf has let its readers down. If the illusive editorial shortfalls in this book were found and fixed, Rome would be what it wants, no what it deserves to be: the seminal reference to all things Roman—scholarly, yet accessible—sitting on the shelf generation after generation. More than one sentence could benefit from a critical review; the occasional thought is left unfinished, some transitions from subject to subject and writing style to writing style are missing. Who exactly is the “intermediary” class of Romans referred to on page 25? By this omission, the same man who rendered the brutal history of transportation of convicts to Australia a riveting and accessible read occasionally dulls the shine of his Rome. It is hard not to be in awe of a man who knows so much and is able to share that knowledge with the lesser mortals. Robert Hughes investigates Rome’s earliest days, waving away the fog of its mythic beginnings, then moving effortlessly, though somewhat arbitrarily, through its famous and infamous emperors. He reconstructs the artistic burgeoning of the Renaissance, honing his laser sharp critical vision on the masters, giving one a sense of seeing, or at least appreciating artist such as Michelangelo for the first time. Mr. Hughes is most disappointed by the Rome of the 21st century. Such a large and ambitious work couldn’t hope to avoid contradictions. He seems incredulous that soccer is more popular among today’s Romans than high art and culture, though he took the time in the beginning of the book to chronicle the Roman games of ancient times, noting their popularity. But Mr. Hughes doesn’t make this connection. After chronicling the ebb and flow of Rome from its beginning he ends on a note that only barely allows for the possibility of another recovery. “. . . The Rome of Berlusconi is no longer (and cannot possibly become again) the Rome of Fellini [? ]” In this, he fails to understand the very story he has taken the time and effort to tell.